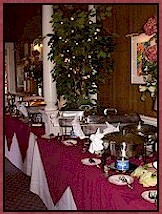 Our catering division is happy to assist you in parties on our premises or at another site selected by you. We have catered all types of events across the entire Gulf Coast, and it would be our pleasure to prepare a detailed proposal for your upcoming event, whether it is a wedding reception, a rehearsal dinner, a Mardi Gras ball or any other type of event. We cater indoors and outdoors and have done numerous parties on the lawns of some of the Gulf Coast's finest homes and historical locales. Here is a listing of just a few of our most popular catered dishes, but there is more that we can do. Pick your favorites and email us for a detailed pricing guide and proposal. (Lagniappe's version of Fettuccini Alfredo, BUT even better!